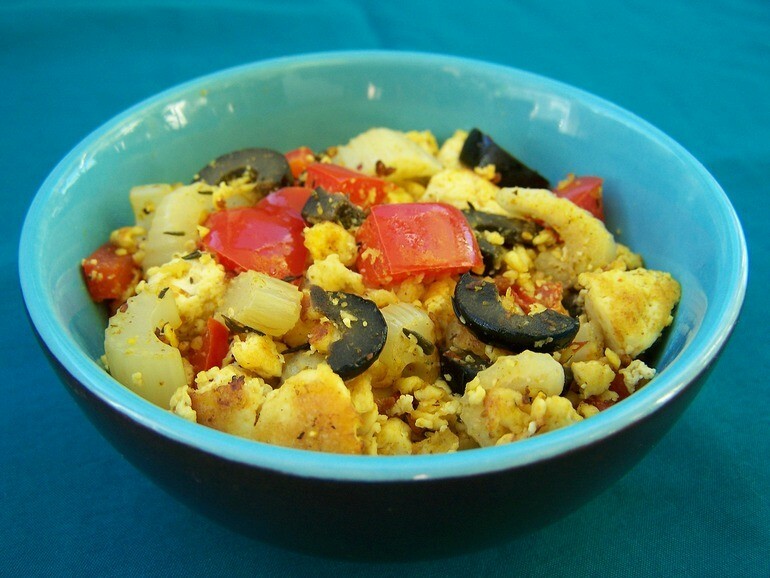 What's a vegan blog without a few tofu scramble recipes right? This is my favorite scramble. It's super flavorful, filling, nutritious and very fast to make. I know scramble is traditionally a breakfast food, but I actually prefer to eat it for lunch, or even dinner! Serve it with a simple green side salad or a (lettuce) wrap to round out your meal. This recipe is very flexible. You can add any veggies you have lying around that need to be used up. You can also vary the spices. Try a Mexican flavor by swapping paprika for the curry powder and using oregano instead of thyme. The cooked scramble will keep for a few days in the fridge, so if you are the food prepping type, make a double batch to have on hand for quick meals. Put a large skillet on medium high heat and add the oil. Drain your tofu and use your hand to crumble it into the skillet. Fry the tofu for about 6-7 minutes until it starts getting a golden colour. Add the vegetables and garic and sauté them for another 5 minutes. Turn down the heat a little and incorporate the spices, salt, nutritional yeast and water into the tofu mixture. Let everything heat through and then take the skillet off the heat. Thank you Kazza! It's really nice to hear from happy readers like you. I just made this, minus the red pepper...personal taste. This was really good and I love the addition of black olives. Thanks! That's lovely to hear Lisa, glad you liked it!